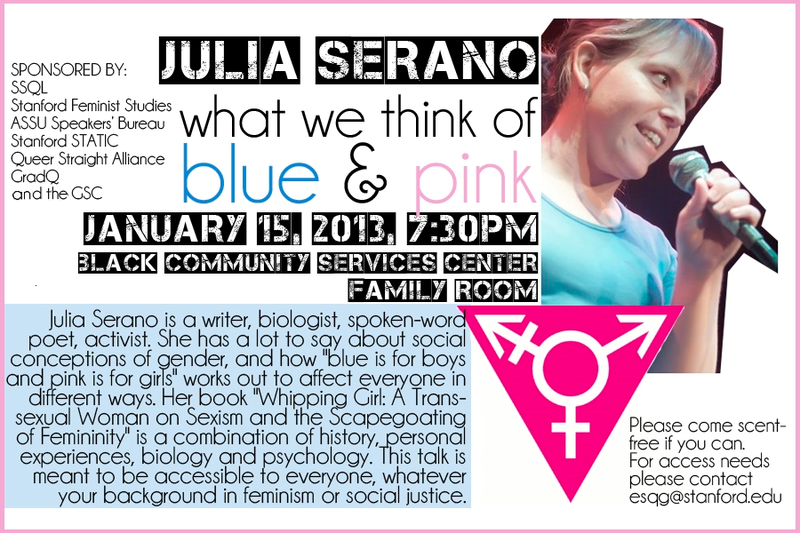 Stanford Students for Queer Liberation would like to invite you to “What We Think of Blue and Pink,” a discussion with activist Julia Serano on Tuesday, January 15th at 7:30 PM in the Black Community Services Center. Students of all disciples are welcome at Dr. Serano’s talk, which will examine social conceptions of gender — for example, the idea that pink is “for girls” and blue is “for boys.” Such prejudices are reinforced through media, literature, and even theories of psychology. Dr. Serano examines this in her book, Whipping Girl: A Transsexual Woman On Sexism and the Scapegoating of Feminity. Tagged activist event, biology, gender, GradQ, Graduate Student Council, Julia Serano, Lina Schmidt, media, poet, Program in Feminist Studies, psychology, Queer Straight Alliance, scientist, sexuality, Stanford Students for Queer Liberation, transgender, Whipping Girl: A Transsexual Woman On Sexism and the Scapegoating of Feminity. 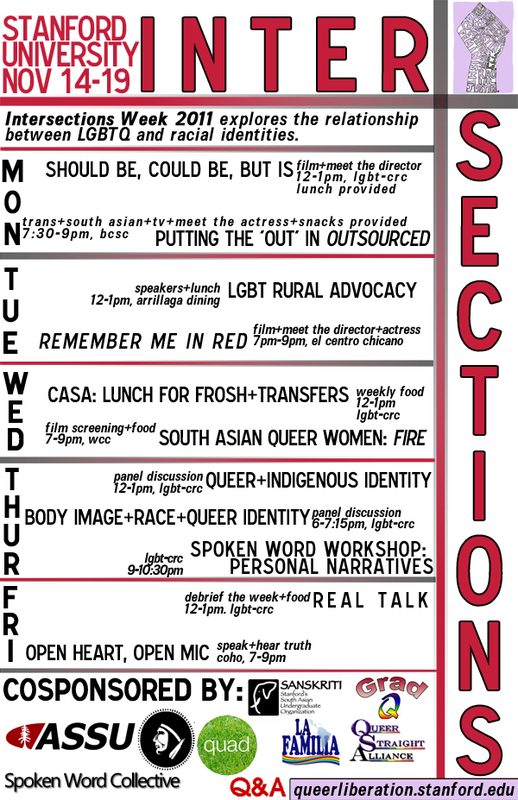 Intersections Week 2011 will explore the relationship between LGBTQ and racial identities. Each event was carefully designed to be open, accessible, and meaningful to all attendees. This is a week for us to delve into our differences and our similarities as activists and as people. If we as a student body could roll out at 4 a.m. in the name of college football, let’s roll out for addressing and ending oppression on our campus and beyond!